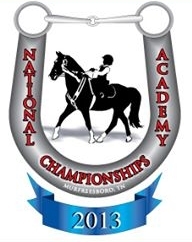 National Academy Championship Horse Show, Murfreesboro, TN, November 1 – 3, 2013. By the time you read this, I will not have been on speaking terms with my stomach for days. I have been looking forward to this show since I heard about it a year ago [Showtime]. Of course I have thoughts about what happens if I win, or win big. Or if I lose, or lose big. But I’m not going there. That would be living in the future. In the run up, I have tried to enjoy the process, the pursuit of the goal, rather than the goal itself. I’ve been to shows. I’ve taken lessons. I didn’t miss a single boot camp session [Boot Camp Begins]. I’ve done everything I could have asked to prepare. And I’ve had fun planning for the show, saying. ‘I want to do X, so that I can do Y in November’. In the past, I have been at barns where I was not ambitious enough. I have been at barns were I was too ambitious. Whatever happens, I have enjoyed working toward goal at place that takes me just the right amount of seriously. The plan is to have inundated you with Tweets by now [Newest]. See sidebar for Tweets, Twitter handle and link to blog Facebook page. OTOH, I’ve heard horror stories of the show running until the wee hours. It may be show, sleep, and surface sometime next week. Let me win. If I can’t win, let me ride well in the attempt.